Rubio has been a headliner in SLO since he ran for Cal Poly as an undergrad, and later, took the podium at some of our most iconic local races, the Thanksgiving Hunger Run and the Waterbury Rock-to-Pier. An elite runner in his own right, he was a high school and college All-American and twice qualified for U.S. Olympic Marathon Trials (1992 & 1996). Later, he helped establish the City-to-the-Sea Half Marathon and the Pozo 5K, two more staple races for Central Coast runners. 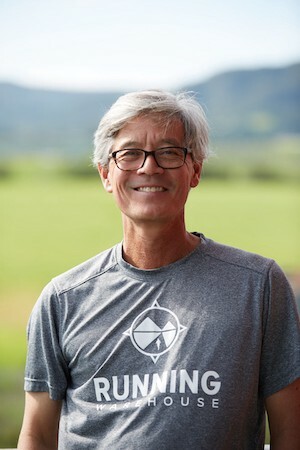 For nearly 20 years, Rubio, now 54, has been coaching the elite HOKA ONE ONE Aggies Running Club, boosting hundreds of local runners from collegiate standouts to national competitors and even Olympic Trials qualifiers. The Aggies boast a reputation for white-hot racing with California chill. Rubio helped develop the facilities at Cuesta College, including the track and the standout Fairbanks cross country course. Through RW, he has supported local high school and college coaches, sponsored shoe “demo days”, breakfast social runs and the highly popular pub runs that put runners in touch with each other, from the lightning speedsters to the run/walkers. These events have helped turn a town with lots of runners in it, into a community of runners. Perhaps Rubio’s most visible face is the large store-fronted warehouse on Suburban Road that houses the remarkable Running Warehouse. The original vision for RW was to stock everything for the runner, the bread-n-butter footwear along with running specialty items. Not only shoes and singlets, but hydration systems, GPS and trail gear. Add impeccable customer service from a staff that knows running from the inside, and you get a business that is finely-tuned to its niche market. In economic times that saw some run specialty shops closing their doors, Running Warehouse only seemed to grow, boasting sales six times the average of other run stores. Running Warehouse is a run hub, providing venues for runners to congregate, share information, encourage each other and, oh yeah, pick up a pair of shoes. Sean Ricketts, last year’s SLO Marathon Hall of Fame recipient, says Rubio is a major force for the local running community. His expertise in running physiology and training is available widely on the internet and has been refined by years of coaching. Joe has generously shared his philosophy and experience with other local coaches such as Brian Locher, cross country and track coach at Cuesta College. Locher attributes much of his own success as a coach to Joe’s guiding hand when he was a young runner. Indeed, the entire community of running professionals in SLO cannot seem to say enough about the character and influence of this year’s honoree, Joe Rubio. Rubio’s influence is broad, affecting every central coast runner in one way or another, but many runners have no idea who he is, which is fine with Rubio. He is a lifelong runner with a true passion for the sport. As with most people driven by excellence, kudos from the outside are unnecessary, but the staff of the SLO Marathon is proud to present Mr. Rubio to the community as a model of “showing up” to the rigors of training, coaching and building a business that shines on the local landscape. The SLO Marathon Hall of Fame is a tradition for recognizing those individuals in our area who have most contributed to the running life by their own accomplishments in the sport, coaching and community service. Joe Rubio is a “shoe-in” for this honor! The community of runners built up by his decades-long influence will have a chance to thank and honor Joe Rubio onFriday, April 28, 5:30pm, during the Endurance Town USA VIP & Hall of Fame Party at the Race SLO tent on the Madonna Inn grounds, and on Sunday, April 30, 11:30am at the awards ceremony for the 2017 SLO Marathon + Half finish festival where he will be inducted into the SLO Marathon Hall of Fame.